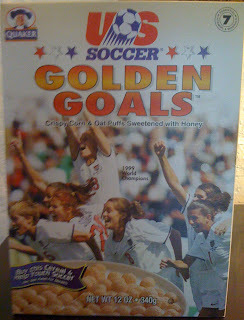 Best Present Ever - Cereal Box, Celebrating US's 1999 World Cup Victory! 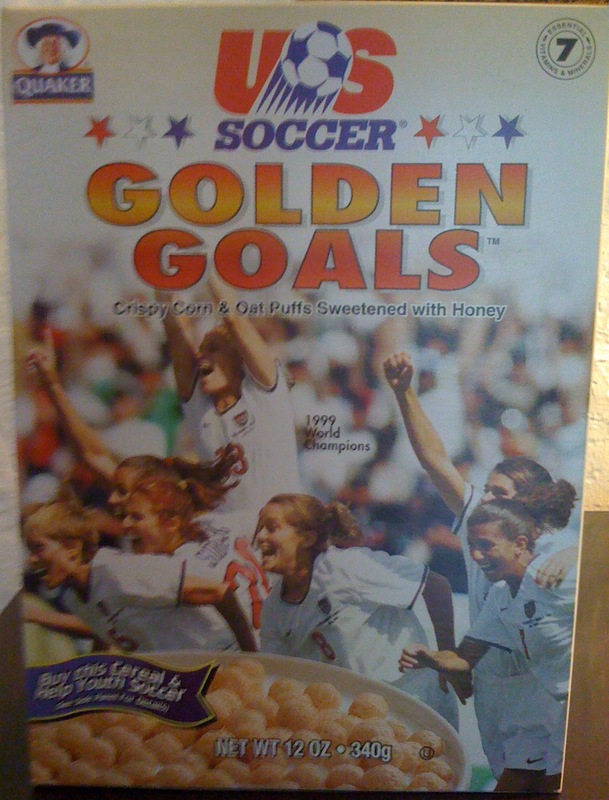 This scarcely needs comment - a US Soccer Golden Goals cereal box. A friend just bought it as a thank you present, she spied it at a shop which just bought up a collection of commemorative cereal boxes. Watch this very informative story from Al Jazeera. Reaction to last week's post about football and hijab has been caught up in the veil (represented by some commentators as the first step in a "slippery slope to fundamentalism"). Some readers seem to have lost sight of the story at hand: whether FIFA's support of the ban against headscarves specifically, and hijab more broadly, makes sense. In looking for models for more productive discussion of the question of headscarves and football, I've been reading over some academic work on the veil debate, and find myself compelled by discussions about the local complexities of hijab. In last week's comments section I pointed to a June conference in Canada - I'm inspired by the abstracts for papers to be presented at that conference, some of which center on practical questions like Heather Marie Akou's query, "to what degree does this [athletic hijab] create new stereotypes concerning what the 'proper' Muslim female athlete should look like?" ("Islamic Swimsuits" Filling a Need or Creating a New One? "), and by Rikke Andreassen's suggestion that we ask "in which specific moments and spaces are veils destabilizing [or not]? "("Destabilizing Effects of the Veil(s) - Examples from Contemporary Europe", and then there is Ipek A. Celik's interrogation of the association of the veil with "passive victimhood" and a "failure to integrate" in a paper that explores how the liberal marketplace produces this narrative for popular consumption ("Veiled Women's Narratives as Marketable Commodities"). Clearly, hijab has a destabilizing effect in relation to FIFA's regulating presence in international women's soccer. FIFA makes football a global game by making it look the same - by imposing a conformity on the game in order to allow each nation's football culture appear to be interchangeable with every other nation's football culture - perhaps should I say market, here, instead of culture? Why do women provoke so much trouble in regulating the game, in making the game "uniform"? Why does the female athlete provoke such a challenge that for decades women were prohibited from playing it at all in countries like England, Germany and Brazil? What exactly is so dangerous about a headscarf-wearing soccer player? Perhaps one of the reasons why some people can't stand the idea of women playing in headscarves is that images of Muslim women playing this physically demanding sport in hijab challenges a world-view that needs to see the Muslim woman only in terms of radical victimization, and as a completely powerless and passive body. Surely there must be room here for a non-hysterical conversation about more complex processes - for a discussion, for example, of the impact of the normalization of hijab in sports on Muslim women athletes more broadly, or, alternatively, of the ways that some uses of hijab in sport may disrupt discourse on hijab (and gender) in significant and unanticipated ways.